Okay, that’s a little dramatic. My car battery died yesterday. A fair, albeit obnoxious price to pay for leaving the dome light on overnight one too many times. Luckily for me, a friend was available nearby for a jump. Unluckily for me, that friend was even less qualified than I was to accomplish the task. I should not have worn jeans in the middle of the summer. I’m so glad this random person on the Internet knows how to do this. Seriously. If that mechanic hadn’t posted something online showing me how to jumpstart a car, who knows how long I would have been stuck outside, staring at my defunct Accord, sweating in my poorly-chosen pants? Just because we know what to do doesn’t mean we always know how to do it. For real estate agents, this feeling often rears its ugly head when you sit down to write a blog post. Sure, you know you need a blog and you know it needs content, but what should that content be? 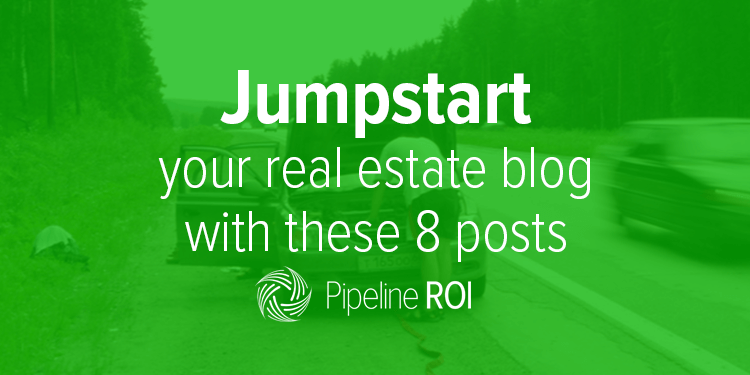 Never fear, Pipeline ROI is here with eight ideas to get you started and get your real estate website blog back on track. Think of us like my friend with the jumper cables and the tutorial guy on YouTube all in one. FSBO listings are bad for agents, but more importantly, they’re bad for consumers on both sides of the sale. We all understand the allure for sellers to keep more of the money from a transaction, so building a strong case is important here. Remember, you’re a professional! Don’t be afraid to brag on your experience and the time you’ve spent in the industry. You can even throw in an FSBO horror story and how you solved the problem, if you’ve got one in your back pocket. Everyone loves a good anecdote. Topics covered in your post can include marketing power (agent vs. FSBO), higher average sale price (agent vs. FSBO), negotiating skills/experience, time/energy/knowledge required, etc. Buying a home is a huge event in a person’s life. Being the agent who reassures a nervous buyer or seller when they’re doing research about the process gives you major brownie points when they’re choosing who to work with. Showcasing your industry knowledge is a great way to do just that. No one wants to feel like they’re receiving bad information, so providing them with correct answers to a list of topics that might be confused about can go a long way. Go through your old emails for inspiration and to find common misconceptions/questions. You’ll find more here than you expect. Some examples might include needing (or not needing) to renovate, how to determine the market value of homes, the danger of setting too high of a price point, etc. Selling a house is nowhere near as enjoyable as buying one. It’s stressful, a nuisance, and, if it goes on too long, can drive owners crazy. Because so much of the market is out of their control, giving sellers even small action items to help expedite their time spent on the market can be the difference between a happy client a nightmare. Lighting, organization/clutter, pets, cleanliness, and more play a part in how well (or poorly) a home shows. Don’t be afraid to get real with your potential clients about what will make them successful. An obvious follow-up post to your selling tips, home staging advice dives further into the specifics of interior design and what it will take to appeal to the average buyer. If you’d like to double down on your marketing power on this page, consider offering a free home staging consult to interested sellers. This is a great way to gather qualified leads, sway FSBOs away from doing it themselves, and expand your name and brand recognition. Add a call-to-action (CTA) button to your post that directs to a landing page advertising your free offer. Describe the service you’ll provide and attach a form that allows them to sign up. You’ll get their contact information for future marketing and they’ll get your professional opinion and advice. Win-win. It’s no secret that closing is a beast. However, that beast differs greatly depending on whether someone is a buyer or seller. 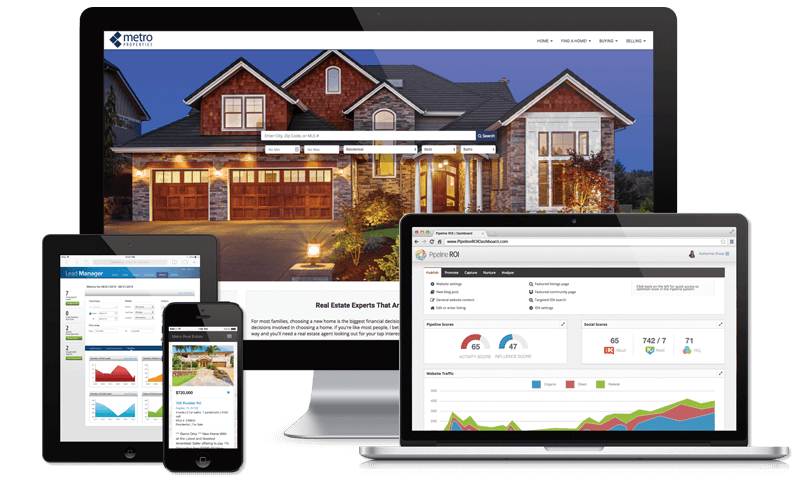 Displaying your knowledge across both sides of the transaction is a great way to show website visitors that not only do you know your stuff, but you can handle their specific situation regardless of what it may be. Explain not only what happens but why and when. Make sure it’s as easy to understand as possible and conversational in nature, as you never want the process to seem intimidating or scary. Part of being a successful real estate agent is being a local expert. The ins and outs of your community make a huge difference to those interested in putting down roots. And let’s be honest, if you didn’t love it, you wouldn’t live in your town either! Share the things you enjoy about the local area. Your opinion shows that you are active, involved, and the person to turn to when it comes to the excitement of your city. Keep your core audience in mind when you list your favorite attractions. Sell to families? Talk about parks, not bars. Work mainly with retirees? They probably don’t care about the best local pools. They key to content is keeping it geared specifically toward the folks you work with most often. Convincing someone to live in an area devoid of beauty can be a pretty hard sell. No one wants to settle down somewhere unappealing to the eyes. Take it from a Great Plains native – sometimes you have to look a little harder to find the areas worth traveling to. Make a list of the places around you that take your breath away. Whether you live in an urban area or a rural one, local sightseeing spots are a critical part of selling someone on your community, not just a specific home within it. If you’re stuck, do a Google search for local hiking spots, state/national parks, or wildlife reserves. If you or your average customer are inclined more toward the city, don’t be afraid to throw in your favorite art museum or bookstore. The idea here is really just to show life beyond the walls of their future home. Once again, your core audience will play a factor in what you write about here. The great thing about this post idea is that you can do it over and over again with different topics. Whatever you think will appeal to your customer base (which you can learn more about here), write about it. Again, this is about showing off your knowledge of the area. Demonstrating you’re “in the know” will do wonders toward convincing an unsure potential customer you’re the agent to go to if they want the best house in the best area of your city. Even if you’re not a coffee drinker, a list of the best places to grab a cup appeals to a wide range of buyer personas. The same goes for restaurants (this can even be broken down further by restaurant type), locally owned retail stores, and museums. Don’t forget to include pictures to make your post pop! Okay, okay. I’ll admit it. It’s a bit more work to write a blog post than it is to jumpstart a car. Plus (hopefully) you do it a lot more often. The biggest distinction, though, is the end result. After I left the parking lot, blasting my A/C all the way to the nearest Jiffy Lube, I ended up having to spend over $150 replacing the battery I just jumped. Your experience is vastly different. When you add to your blog, things only get better. With more posts come more leads. With more leads come more customers. And with more customers come more commission checks. I know it takes a little bit of sweat to pull it off, but you’ll be glad you did. If you need any more help with getting a blog post off the ground, check out our tips for writing readable content! Then, give us a call. Pipeline ROI has all the tools you need to maintain a successful blog, along with much more pre-written, pre-loaded content for your brand-new website. Click below to learn more and get a free demo.